Headquartered in Wilmington, WhyFly gives businesses and residents alike a choice in internet connectivity. With connection rates of 100mbps to 1Gbps, down and up, WhyFly can meet all of your needs for internet connectivity. Including VOIP Phones, Surveillance Cameras, Access Control and WiFi Hospitality Services. NO extra fees. NO Taxes. NO Contract. NO Shenanigans. Simply fast internet service backed by great customer service. Christiana Pleasant Dental is a family dental practice located at 72 Omega Drive, Building D, Newark, DE, 19713. We are offering a $50 Amazon gift card to all NCCCC members and their families with their first cleaning, and check up. Hope to see you soon! 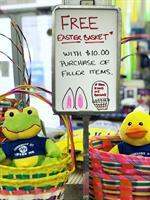 Purchase $10 or more of Easter basket goodies and receive a FREE Easter basket. Home buyers and home sellers need an experienced guide and trusted experts to make dreams come true. Realtor and Broker with unparalleled service and skills are available to you. Use my connections for mortgages, inspectors, lawyers, and every aspect that covers a successful transaction. Boost Conversions with Marketing Video Package. Get better results from ALL of your marketing efforts by leading prospects to your exciting vide. Improves conversions from google PPC ads, Facebook ads, email campaigns, social media posts, and even direct mail! 30 second video will make your phone ring!